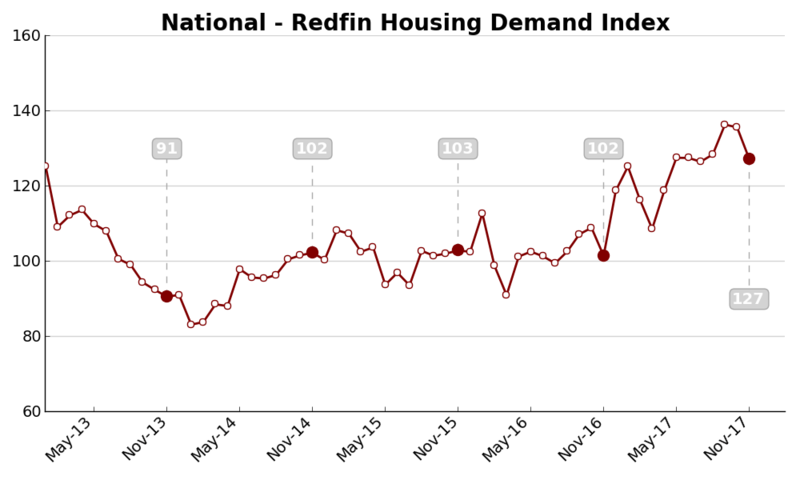 “Three years of low inventory is taking its toll on buyer demand in terms of tour and offer activity,” said Redfin chief economist Nela Richardson. 6.2 percent annual gain in October, up from 6.1 percent in the previous month. The 10-City Composite annual increase came in at 6.0 percent, up from 5.7 percent the previous month. The 20-City Composite posted a 6.4 percent year-over-year gain, up from 6.2 percent the previous month. In October, Seattle led the way with a 12.7 percent year-over-year price increase, followed by Las Vegas with a 10.2 percent increase, and San Diego with an 8.1 percent increase. 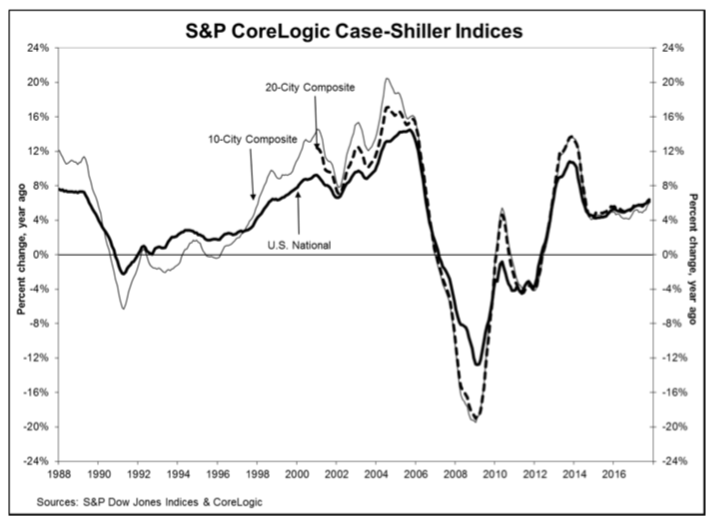 “Home prices continue their climb supported by low inventories and increasing sales,” says David M. Blitzer, Managing Director and Chairman of the Index Committee at S&P Dow Jones Indices. “Nationally, home prices are up 6.2% in the 12 months to October, three times the rate of inflation. Sales of existing homes dropped 6.1% from March through September; they have since rebounded 8.4% in November. Inventories measured by months-supply of homes for sale dropped from the tight level of 4.2 months last summer to only 3.4 months in November. “Underlying the rising prices for both new and existing homes are low interest rates, low unemployment and continuing economic growth. Some of these favorable factors may shift in 2018. The Fed is widely expected to raise the Fed funds rate three more times to reach 2% by the end of the New Year. The net share of lenders reporting demand growth over the prior three months has fallen for all loan types when compared with Q4 2016, Q4 2015, and Q4 2014, reaching the lowest reading for any fourth quarter over the past three years. However, the net share of lenders expecting increased demand over the next three months remains relatively stable for the fourth quarter over the past three years. On net, more lenders reported declining demand over the prior three months, continuing the trend that started in Q1 2017. For the next three months, the net share of lenders expecting growth in demand for refinance mortgages dropped from last quarter (Q3 2017) across all loan types, reaching the worst outlook in a year. The net share of lenders reporting easing of credit standards over the prior three months has continued its upward trend since Q4 2016 across all loan types – reaching new survey highs for the second consecutive quarter. Expectations of credit easing over the next three months declined on net for GSE Eligible loans. On net, lenders continue reporting expectations to grow GSE (Fannie Mae and Freddie Mac) and Ginnie Mae shares over the next 12 months and reduce portfolio retention and whole loan sales shares. This quarter, slightly more lenders reported expectations to decrease rather than increase the share of MSR sold and the share of MSR retained and serviced in-house. The majority of lenders continued to report expectations to maintain their MSR execution strategy. 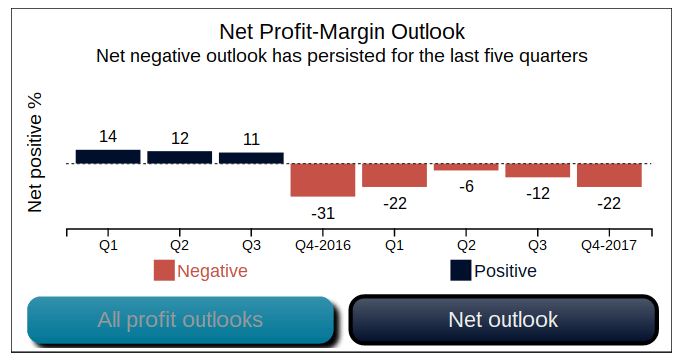 Lenders’ net profit margin outlook has been negative for five consecutive quarters (since Q4 2016). Those expecting a lower profit outlook generally point to “competition from other lenders” as the primary reason. While institutions of all sizes and types generally reported an expected net decrease in profit margin, larger institutions were the most likely to do so. “Competition from other lenders” set a new survey high for the fourth consecutive quarter across all profit margin drivers, cited as the key reason for lenders’ lower profit margin outlook. The other top drivers for a decreased profit margin outlook include consumer demand, staffing, and market trend changes. “Key trends have persisted throughout this year,” said Doug Duncan, senior vice president and chief economist at Fannie Mae. “Lenders who see declining profits outweighed those noting improvements in the bottom line for the fifth consecutive quarter. Three-fourths of those seeing deteriorating profits cite competition as the most important reason — a survey high — compared with only about one-third two years ago. “This is not surprising given that refinance volume continues to shrink. More lenders reported a pullback in refinance demand from the prior quarter than those who saw an increase, continuing the trend that started at the beginning of the year.